If you’ve traveled along the gorgeous 101 Highway connecting the northern and southern parts of California, you’ve also traveled along a piece of California history! 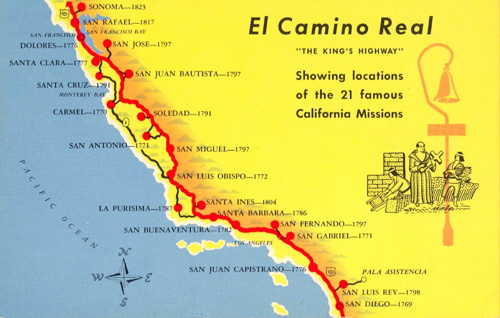 California’s “Royal Road” or El Camino Real, is the historic 600 mile stretch of roadway that was intended to connect the established missions for travelers and visitors. Still standing today are the commemorative bell-markers, which can be spotted as your travel along this highway. These special markers served have a distinctive shape, hanging on support poles in the shape of a shepherd’s crook to commemorate a Franciscan walking stick. These bells on the shepherd’s crook are a unique nod to the many Franciscan monks who founded this original road. In the early days, the road was a way for travelers to leave one mission in the early morning hours and follow the path to arrive at the next mission before nightfall. 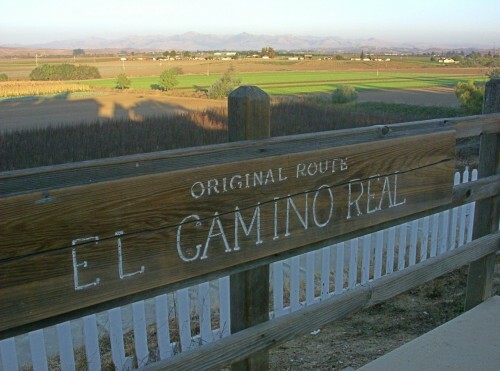 A continuation of the Baja California mission trail, El Camino Real was a huge expansion for travelers and allowed many more to visit the colonized areas of California. During these times, the road was constructed of essentially nothing at all, just a simple dirt path to be taken upon by foot. As the mission system increased and traffic became heavier, this modest trail was transformed to a dirt road perfect for larger groups and wagons. 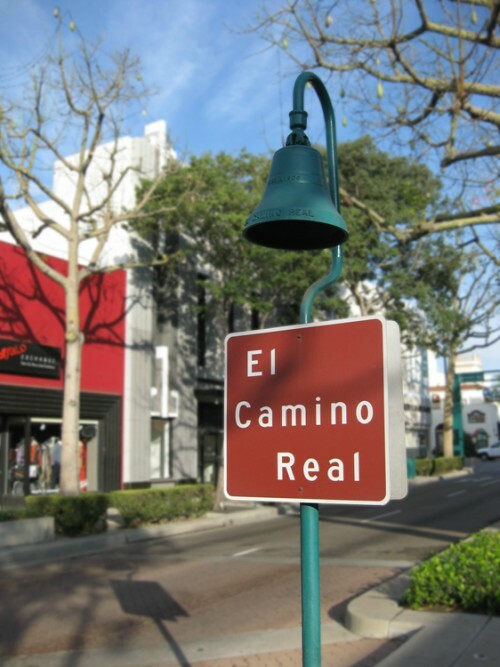 Today, it is easy to travel along El Camino Real and take in this amazing part of California history! As you travel up and down this beautiful highway, take note of the many bells marking what is an important spot in the creation of this state. Not only do these bells connect you to cities and counties today, but they also can serve as a way to find some amazing, historical California landmarks, like the missions. If you’re looking to follow along a commemorative trail route, there are several ways to enjoy this piece of history. California State Legislature notes the full modern route as follows: Interstate 5 (US-Mexico border to Anaheim), Anaheim Blvd, Harbor Blvd, State Route 72, Whittier Blvd (Anaheim to Los Angeles), US Route 101 (Los Angeles to San Jose), State Route 87 (Santa Clara County), State Route 82 (San Jose to San Francisco), Interstate 280 (San Francsico), US Route 101 (San Francisco to Novato), State Route 37 (Novato to Sears Point), State Route 121 (Sears Point to Sonoma), and State Route 12 (Sonoma). You won’t be disappointing by the amazing scenery you spot along the way in all these beautiful California cities and towns. Stretches of road can also be found in other areas, such as an East Bay route and smaller, unpaved paths like the one next to Mission San Juan Bautista. Ride along and enjoy the view as you take in the amazing history of beautiful California!